Coba is located 90 Kms from Chichen Itza and 40 kilometers from Tulum. In this guided tour you will visit this historical mayan city full of temples, you will know one of the oldest of the time, the temple "Nohoch Mul", considered the highest pyramid of the peninsula with 42 meters high and 152 steps. At Tulum admire the restored temples inside of the "walled city" and be part of the history of this ancient sea port and ceremonial center, the only mayan archaeological site built on the shore of the sea with an spectacular view to the Caribbean Sea. 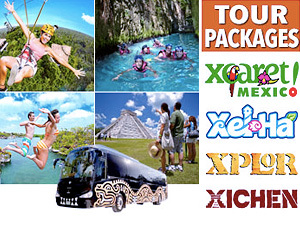 To complete this tour we will visit Xel-Ha where you will live a Mayan experience by tasting traditional food and beverages, going through the nursery, getting to know the history of gum, the importance of the Ceiba, a sacred tree, and the meaning of the melipona bee to the Mayan culture. During your visit to Xel ha, you will enjoy a delicious Buffet with a variety of Dishes. Box lunch on the way to Coba and light snacks on the way to Tulum. Guided tour of the archaeological sites of Coba and Tulum (45 min each) and free time to explore on your own. The use of video camera in the archaeological zones pays an additional tax that is not included in the cost of the tour. Archaeological sites do not have adequate facilities or access for the use of wheelchairs or strollers. Children from 5 to 11 years old pay child rate but must present identification to check their age at the time of boarding. Uses biodegradable insect blocker and repellent containing only titanium oxide and zinc oxide. Transportation is available at most Cancun and Riviera Maya hotels from Monday to Saturday. The exact pick-up time will be sent after booking.